D-Link makes some good-looking technology. Better known for its routers, this networking equipment manufacturer also makes a fairly extensive line of sleek, modern-looking home security cameras. While we techies always get excited about good visual design, it can never trump functionality, so we dug in and extensively researched D-Link’s home security camera collection to find out whether or not the cameras really perform. We’ve whittled the catalogue down to a more manageable collection of D-Link’s better cameras and divided our selection into four separate categories: Indoor Wi-Fi, IFTTT-capable, pan and tilt, and outdoor. Overall, the customer consensus with D-Link is that the cameras themselves have fantastic hardware, but its software, app user interface, and customer service leave a lot to be desired. The security of D-Link’s products was also called into question recently, and while nothing’s been resolved, it’s concerning nonetheless. If you’re still interested in checking out D-Link, read on to see our full review and recommendations. Summary : D-Link is a network device manufacturer with an extensive line of app-monitored home security cameras. While these cameras have robust features and quality hardware, the supporting apps’ user interfaces and the company’s disappointing customer service undermine otherwise good products. Already know what kinds of cameras you are looking for? Skip ahead. D-Link’s wide-angle cameras are equipped with de-warping technology to minimize distortion from the wider lens. We’ve recommended only D-Link’s wide-angle models here because they have the most updated features, and because a wider-angle camera has far greater versatility than a camera with a narrow field of vision. If you want just a camera trained on your front door to see who comes in or out, a cheaper camera with a narrower field of view will be sufficient. But if you want something that could cover an entire room, you might as well spend a few extra bucks on a wide-angle camera. Our top pick, the DCS-2630L, has a combination of all the desirable features of its predecessors, including 1080p resolution, 180-degree field of view, two-way audio, and 8x digital zoom. With all of these, it delivers a crisp, full view of the room to your mobile device, from which you can speak in real-time to the people in the room (or just say hi to your dog), whether it’s night or day. D-Link’s Connected Home series cameras work with D-Link’s smart plugs, motion sensors, sirens, and water sensors to automate your home. You could, for example, create an IFTTT rule to turn on the lights when sound is detected. This could both scare away intruders and save you from fumbling for the light switch when you get home in the evening. Note that instead of using the mydlink Lite app like D-Link’s other cameras, these IFTTT cameras use the Connected Home app, mydlink Home. Of the two, the newer DCS-8200LH model has improved features, including a wide-angle field of view (with de-warping technology), double the digital zoom, and local storage. To us, the wide-angle and the local storage are worth the extra money, but if you aren’t particular about top-of-the-line features, we’ve seen the DCS-935L for as low as $65 through third-party vendors on Amazon. Looking forward, D-Link promised a wireless camera compatible with Apple’s HomeKit later this year, but hasn’t yet set an official release date. A regular camera like those listed above provides sufficient video security for most homes and most users, but if you want to be able to scan the entire room and zoom in for greater detail, a pan-and-tilt camera is the way to go. Pan-and-tilt cameras are fairly standard in places of business, and in the home, they’re useful when you want to keep an eye on your kids or on a relative who requires in-home care. Because they’re large and have movable parts, these aren’t going to be invisible, secret cameras—people will notice them—so it’s best to disclose to any in-home caretakers ahead of time that you have cameras installed for the purpose of checking in on your loved ones. D-Link’s pan-and-tilt cameras are fairly similar, so the one you choose will depend on which features are the most important to you. The DCS-5030L is our top pick because it has a much larger local storage capacity (128 GB versus 32 GB), but with this one you sacrifice two-way audio, some of the field of view (just a few degrees), and about 10 feet of night vision. This sounds like a lot of night vision lost, but in an indoor setting, a lot of homes don’t need a full 26 feet of night vision—for most situations, the 16 feet is enough. If you want to maximize your still field of view, go with the DCS-5029L, but be aware that it only detects motion, not sound. If two-way audio is your priority, the DCS-5222L is your camera. D-Link makes a handful of cameras designed specifically for outdoor use, with UL-certified waterproof housing and more powerful digital zoom and night vision. Although these cameras are built to stand up against rain and sun, it’s always a good idea to place them in a somewhat protected area, like under the eaves of a roof, even if just to reduce glare and keep water droplets off the lens. The biggest difference between the top pick and the other two cameras is their connection types. The newest model and our first pick, the DCS-2330L connects to other cameras and to your mobile device via your home’s Wi-Fi connection, whereas the other two connect via PoE (power over Ethernet). PoE means that the device requires only one cable for both power and a network connection. These two outdoor PoE devices are also equipped with a bracket that covers the connection point, protecting it from moisture and dust. For some reason, you lose a few degrees from the temperature range in the newest model, but unless you live in particularly hot and sunny areas, this shouldn’t be a problem for you. This model also only has one-way audio, which for many uses is fine. If you plan on having a camera at your front door, one of the older cameras with two-way audio may be a better option so that you can virtually “answer” your door. Our second pick, the DCS-7010L bullet camera, is over $100 more than the other outdoor cameras that D-Link offers, so it’s probably only worth the extra investment if you need particularly long-range night vision (the bullet camera can see twice as far as the other two at night). If you’re looking to save money, the older DCS-2310L is often $20–30 cheaper on Amazon, despite its higher MSRP listing. D-Link has made multiple apps for its products, so you’ll want to be sure to download the right one. For most of the cameras listed here, you can use either the mydlink Lite app (iPhone, Android, Windows) for your phone or the mydlink+ app on your tablet (iPad or Android). From these you can access and adjust all your cameras. The only exception is the IFTTT-compatible cameras, which require the mydlink Home app (iOS or Android), from which you can monitor and control all your home automation devices. In theory, these apps allow you to receive motion and sound notifications, live stream, share videos, and control settings. Unfortunately, the apps are D-Link’s greatest weakness. Every version on every platform has feeble reviews, with complaints of crashing, chronic connection issues, and delayed notifications. D-Link’s customer service reputation is… patchy. It has a fairly robust support website, with individual pages for each product where you can register your device, review warranty documents, download firmware updates, read FAQs, watch how-to videos, and contact support. It’s when customers actually use the contact information provided that they run into problems. 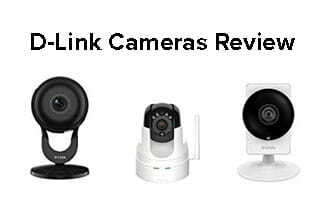 While customers often praise the features of their cameras, many people received either silence or unsatisfactory solutions when they’ve reached out to D-Link for help. The Better Business Bureau gave D-Link a B- rating for failure to respond to multiple complaints filed against the company. If you need to get in touch with D-Link’s customer service, your best bet is to give them a call at 1-800-326-1688. The questions we sent to D-Link via email went unanswered, but our calls were picked up fairly quickly. Unfortunately, there’s no chat feature on the D-Link website, so you’ll have to set aside time to make a call. Read in their own words what other customers had to say about the performance of D-Link’s products and its customer service. Cameras ‘time out’ & stop working after 1 minute always… then you have to start all over. D-link website is SO TERRIBLY SLOW with an out of date security certificate. Java updates must be downloaded with every visit to website then again during the same visit. I sold the cameras & recorder. Today 2-6-15 (2:49PM EST) I tried deleting my D-Link account. But you cannot do this without tech support. Do we recommend D-Link cameras? Not yet. Maybe some day in the future. While the cameras themselves are fine contenders against their competitors, the overall poor software and app performance keeps us from wanting to use these cameras ourselves, much less recommend them to other people. If the device is marketed as something that can be monitored remotely from an app, a faulty app will render the devices essentially useless. They’ll still record locally to their MicroSD cards, but you won’t be able to monitor remotely from your phone, so you’ve spent the extra money for this app compatibility for nothing. A recent FTC filing, while not yet conclusive, also prevents us from making an endorsement because if these cameras are vulnerable to hacking, installing them in your home would make your family less safe than having no cameras at all, not more. If D-Link can make some big changes to its software support and prove that its devices are secure, it has a good chance of gaining our hearty support in the future. In the meantime, if you’re looking for a DIY home security camera system that has a strong app that supports solid hardware, check out our review of NETGEAR’s Arlo cameras. What’s been your experience with D-Link and its cameras? Are poor customer service, weak app user interface, or the possibility of hacker vulnerability dealbreakers for you, even if the hardware is solid?